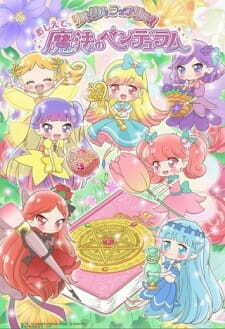 Oshiete Mahou no Pendulum is the third season of the Rilu Rilu Fairilu series, but it can easily be watched on its own. The story follows Alice, a young girl with barely any confidence, self-esteem or social skills. Every episode, she summons fairies with a magical pendulum and a book and they bring her to Little Fairilu, the fairy world, where she learns to overcome whatever issue she has at the moment. Alice learns how to make friends, to be proud of what she likes even if it's different from what her friends like, to have more confidence in herself, etc. Seeing Alice overcome her problems is very wholesome and heartwarming. The show is episodic in nature, so watching in order is not necessary. When Alice is in the human world, the show is animated in CGI. It doesn't always look very convincing, but still not a deal-breaker. When they get in Little Fairilu, the show goes for a deformed chibi style with bright colors, giant eyes and plenty of blush. It does look somewhat cheap and not very detailed, but the bold lines, character design and colors make up for it. Overall, Oshiete Mahou no Pendulum does the bare minimum in the visual department, but it works. Edit: Taking another good look at the animation, I might be wrong about the CGI. There's definitely something weird about the animation in the human world, but it might just be how the lines and shading are done. Forgettable stuff, but the voice acting is good. You can get a good feel for each fairies' personality just by the way they talk. I love cute and brightly colored things so this show hits a weak spot for me. It's nothing special, but if you're looking for a cute and wholesome show for kids I definitely recommend Oshiete Mahou no Pendulum. It deserves more love than what it's currently getting.